ok, it turns out it was just a big advertising campaign. but it was pretty. It is pretty! 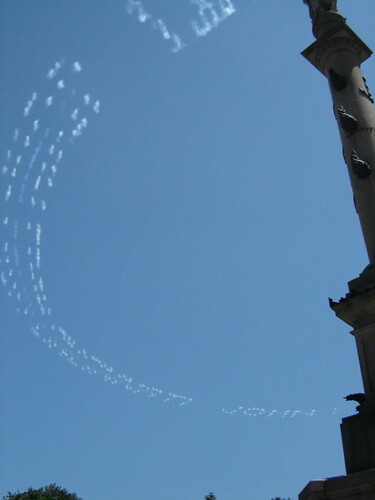 I saw a skywriter once– I think it was a beer ad– but it was so cool to see the way the plane formed the letters. This amazes me… I saw one a few years ago at the beach. Very cool photo. You were at the right place at the right time. I stood there forever trying to figure out what it said! That’s some creative advertising. Was it easier to read in person? That is SO cool. We have skywriters often here, but they never do stuff in a circle! How COOL IS THAT!!! Fascinating. Subliminal messages in the sky….